Model: The locomotive has an mfx digital decoder and extensive sound functions. It has controlled high-efficiency propulsion, centrally mounted. 4 axles powered in each power truck. Traction tires. The locomotive has 2 power trucks and 2 pilot trucks and can negotiate sharp curves. LEDs are used for the lighting. The headlights and the cab lighting will work in conventional operation and can be controlled digitally. The locomotive has large American design pantographs. Length over the couplers 28 cm / 11". The car set to go with this locomotive can be found in the Märklin H0 assortment under item number 43616. A wider wiper for the pantograph may be necessary for operation under catenary mounted in a zigzag pattern or bent to follow a curve. A suitable wiper set is available as a spare part: item number 231802. 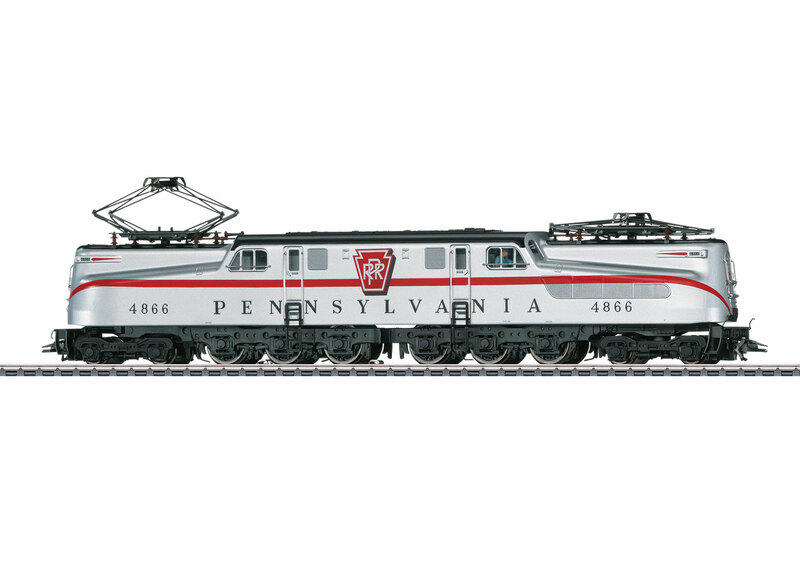 37494 – Pennsylvania Railroad (PRR) GG1 In 1933, the Pennsylvania Railroad (PRR) had a completely new electric locomotive designed for fast heavy passenger train service on its flagship route New York - Washington that was electrified at the start of 1935 – the GG1. A first prototype was built by August of 1934 as a 4-6-6-4 unit at General Electric (GE). It had two powered trucks, each with a two-axle pilot truck. Power transmission from the traction motor to the wheel set was done with a reduction gearbox and a Westinghouse spring drive in which two 288 kilowatt / 386 horsepower GEA-627-A1 electric motors drove each wheel set. The prototype had a streamlined body with a center cab and was impressive at high speeds. On November 10, 1934, the PRR ordered 57 more GG1 units whose locomotive bodies were reworked by the famous industrial designer Raymond Loewy. General Electric built 14 regular production units in Erie and 18 were built in PRR's shops in Altoona. Final assembly of the remaining 25 GG1 units was done in Altoona with electrical components from Westinghouse and running gear from Baldwin Locomotive Works in Eddystone. 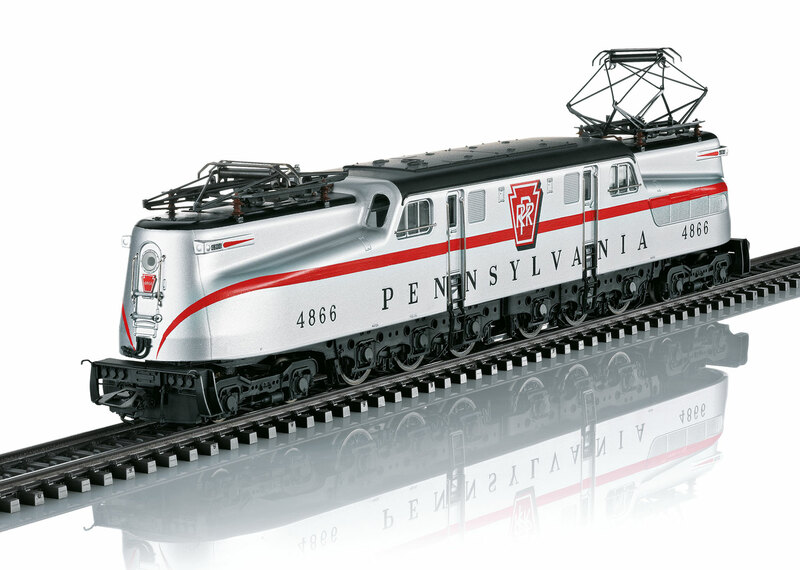 Another 81 units of this exceptionally elegant, beautifully shaped American electric locomotive were built between 1937 and 1943 in Altoona. With their steam boilers for car heating, the GG1 locomotives were in fact thought of as passenger locomotives, but they could also be used to pull freight trains. Their gear reduction was designed however for fast passenger train service. As the GG1 units aged and newer types of locomotives became available, many of the GG1 locomotives ended up in freight train service and were equipped with special gearing for this purpose. Starting in 1955 the PRR equipped a large number of GG1 locomotives with large air intakes on the end areas. In the same year, three locomotives (4866, 4872, and 4880) were given a special but short-lived paint scheme in silver with broad red stripes for the "Congressional Limited" deluxe trains just modernized for service between New York and Washington. On February 1, 1968, the PRR merged with its archrival of many years, the New York Central Railroad, to form Penn Central (PC), which had to file for bankruptcy as early as 1970. The different successor companies Amtrak (40 units), Conrail (75), and NJ Transit (13) divided the 128 units of the GG1 fleet among themselves. At least 16 locomotives of this class with its beautiful shape are preserved as museum pieces, but none of them is operational. B Single headlights that change over with the direction of travel.